Who was wearing what & where? World War ll had an effect on the fashion industry everywhere even in the home of haute couture, Paris. After the Nazis occupied Paris they insisted that the fashion industry be transferred to Berlin, and although they did eventually withdraw the order several couture houses closed down. 'Coco' Chanel shut up shop a year before the outbreak of war and later benefited by having a top Nazi official as her lover. A lot of other top designers either retired or went into exile. Expensive fabrics such as silks and lace were no longer available in Paris and ordinary fabrics were restricted. This, along with the mass exodus of the Jewish fashion workforce (they were either forced to go abroad or further south e.g. Nice) meant the collapse of the French fashion industry centre. Few fashion houses continued in their pre-war status but worked mainly for wealthy collaborators or exported designs to Germany. The designs at that time in France were full skirts, high-heeled shoes and even fur coats for those who could afford them. The French designers argued that their designs were in defiance of the German restrictions and also meant that there was less fabric available to the enemy. In Paris, women began to make the hat their expression of fashion, as material was rationed, but flowers and feathers were not. So an explosion of colour and style could be seen on the heads of many women. Americans and Britons knew that by saving cloth they were assisting the Allied cause, but with a general lack of news from occupied Europe it meant that the fashion conscious of America and Britain could no longer get inspiration from Paris. their own style. Since the U.S. did not have as many restrictions, the American women enjoyed fuller skirts, colourful high-heeled shoes and nylon stockings. New York did not become the new capital of fashion but the American designers did lead the way in work and leisurewear combining stylishness and practicality. The designers such as Claire McCardell produced clothes for the working women - which stood for 'freedom, democracy and casualness'. Levi jeans and sloppy Joe sweaters swept across the American teenage population. For convenience, many working women took to wearing slacks (trousers). 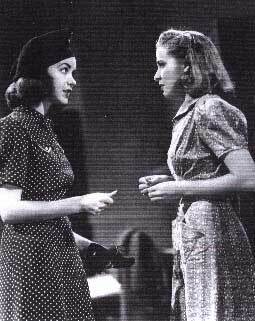 By summer 1944 it was reported that sales of women's trousers were five times more than the previous year. In 1940 Britain silk stockings were in short supply. To take their place various brands of leg make-up appeared on the market and women resorted to drawing seams with eyebrow pencil down the back of each leg to give the appearance of wearing stockings. The fashion was for Short skirts, sensible 'flat heeled' shoes and square shouldered jackets that recalled the cut of uniforms - these were the basic features of the wartime 'Utility fashions'. In March 1941 Ernest Bevin, Minister for Labour called on the women of Britain to help the war effort. Many women of all ages found themselves not only in the munitions factories, but as more women were conscripted they were found in the more male dominated jobs such as tank and aircraft factories. The introduction of women into these areas released men for the services - Army, Air force and Navy. Women could chose to join one of the auxiliary services - The Women's Royal Naval Service (WRNS), Women's Auxiliary Air Force (WAAF), Auxiliary Territorial Service (ATS) or on the land feeding the population - the Women's Land Army (WLA). For the first time Women were to be found in the male dominated areas, manning anti-aircraft batteries, driving trains & tractors, operating cranes and much more. Fancy clothing was out - trousers or dungarees were worn instead of skirts and a scarf was tied around the head to protect against the risk of hair getting caught in the machines. The government encouraged the slogan 'Make do and mend'. 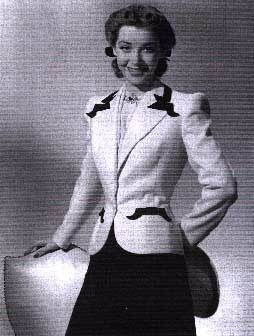 Older clothes were transformed into modern styles and Women's magazines carried tips on how to spend clothes coupons and how to revamp old suits and dresses. Women even converted their husbands' suits into ladies suits to wear themselves as the majority of men were away in the forces. Heavy blankets were converted into fashionable overcoats and knitting was encouraged if you were able to get the wool or unpick an old jumper. Knitting patterns included those for slippers, socks, & jumpers for all age groups as well as patterns for the various services, so a wife could knit a jumper for a loved one far from home. 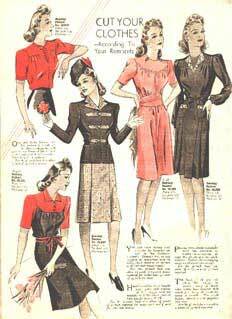 The sewing patterns of the time all had to conform to the same stringent guidelines as the shop purchased clothes. There were limits on hems, pleats and turn-ups. As in America, British women took great pride in their appearance and improvised with make-up and hair products. Gloves, hats and gas masks were a must. Hats could be easily adapted by adding flowers or feathers. 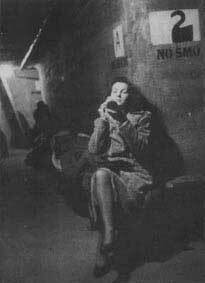 Gas masks were a little harder to hide so bags were made to house the cardboard box and gas mask. Some were even incorporated into handbags as a false bottom. It would have been quite understandable if the war years (especially the years when the German bombing was at its worst) had led to Britains women not bothering with their appearance. The opposite was true. It was seen as almost unpatriotic not to look ones best. The bombs were falling, the cities were burning but the women of Britain were going to do their bit in the fields and factories and keep their morale up by looking their best !